But after much encouraging, my friends relented. And guess what? They loved the food here! In fact, they love it so much that all of them have returned and brought their friends to enjoy the delicious dishes too. This is why I have anointed New Green Pasture Cafe as one of the Best Places To Eat in Singapore. Cuisine: Asian, Fusion, Sushi, Vegan Options – MSG-Free, Low Fat, Minimal Salt, Free from Chemical Fertilizers and Pesticides. 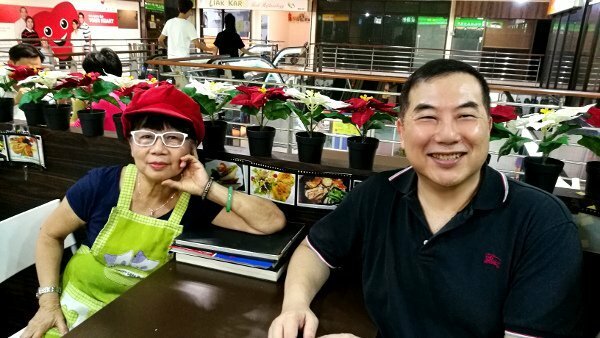 The story of how New Green Pasture Cafe began along the shopping belt in Singapore known as Orchard Road. A petite designer named Ms Sophia Teh found the vegetarian food served in many eating places to be oily and lacking in true nutrition. Most of the dishes were deep fried and actually unhealthy. After years of consuming the typical vegetarian food served at food centres, cafes and restaurants, Sophia began to suffer in health. One of the many afflictions was gout, which brought her much pain for over 7 years. Parts of her body were swollen. There were times when it was even difficult for her to hold a simple pair of chopsticks. Determined to not use western medicine, she attended talks and workshops to learn from doctors on how to heal one’s body through natural methods. In 1984, she made the choice to eat only organic food. She began to cook and eat her own organic meals, and soon her health started to improve. Some of the knowledge she gained were, for example, how Apple Cider Vinegar can help to detox our bodies. She also learned about the benefits of enzymes. Hence, one of the popular drinks at her cafe is the ABC Juice (see photo and description below in Delcious Organic Food section). As she continued exploring the organic world, she noticed that her body healed. All her afflictions were gone. She was also less tired as she found herself more energetic. Today, when you visit New Green Pasture Cafe, you will notice how spry she is for her age. Over the years, Sophia experimented on how to cook organic food in such a way that is very palatable. Today, a lot of her dishes include more raw foods and most are lessed cooked and less processed. All food at New Green Pasture Cafe are MSG-Free, Low Fat and contains Minimal Salt. Of course, being that all of the ingredients are organic; they are Free from Chemical Fertilizers and Pesticides. 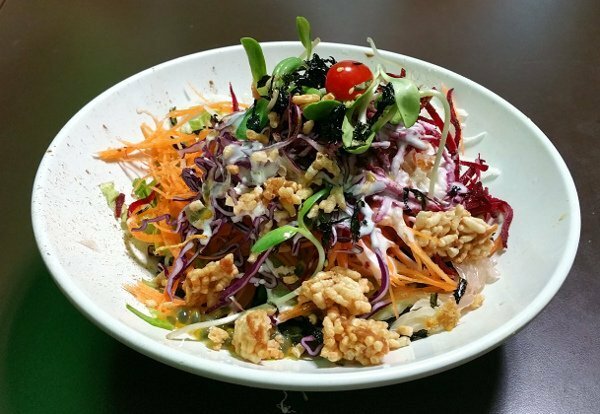 This is my favourite dish – Rainbow Salad with Charcoal Noodles. It used to be the Penang Laksa, which is still very good. But I only have one stomach. If I can eat more at one meal time, I would have both this dish and the Penang Laksa. Yes, greedy me. As you can see in the photo below, there are lots of veggies – carrots, beetroot, purple cabbages, bean sprouts, etc. Truly a rainbow of vegetable delights. The charcoal noodles are hidden below the layers that also include a zesty mix of salad sauce that is slightly sweet and tangy. Together, the combination brings so much pleasure to the taste buds. 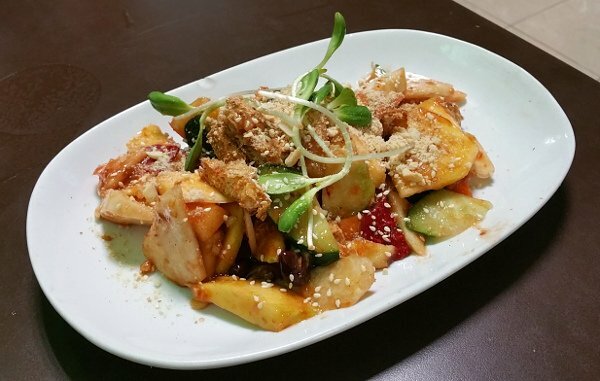 My next favourite is the Rojak! A mix of slices of cucumber, pineapple, turnip, bean sprouts, apples, mangoes and tau pok. The latter is a type of fried beancurd that is flat and square. The outer layer is brown and crispy and the inner is soft and spongy. The sauce used is purely organic and vegetarian. No prawn paste at all (of course, right?). You will be amazed how Sophia has managed to make it taste so much better than the usual rojak sold at food courts, using just organic sauces. The result is a light and appetizing side dish. Whenever I visit New Green Pasture Cafe, I MUST HAVE a glass of ABC juice. 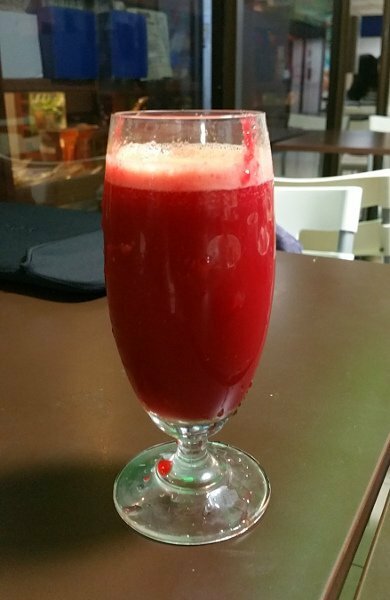 It contains Apple, Carrot and Beetroot that have healthy enzymes. Also, great for detox. On top of it, the ingredients are organic. So you know you are really getting the really good stuff without fertilizers and pesticides leftovers that many fruit juice bars have. The taste is delicious and refreshing! Tip: Drink it all as soon as you can. It is pure organic and leaving it out too long will cause the precious cargo to oxidize and not be as valuable as when freshly served. It is wonderful to dine with friends at New Green Pasture Cafe. We can order a few dishes and share. This way we get to taste new fares from the menu. There was one time I had the chance to try the Ginger Vinegar Set with my friends. Tip: The flavor of the Ginger Vinegar is strong. If you dislike strong flavors, then do not order this. Other than that, it is a really well designed meal. The Ginger Vinegar balanced well with the brown rice and side dishes. Also, the ginger with vinegar is really beneficial for the digestive system. Totally cleansing. Another time, during dinner with friends at New Green Pasture Cafe, we shared the Sri Lanka Roll. After we had it, we understood now why this is one of the most popular dishes here. Tip: It is a little spicy. So only try if you can take spicy food or willing to try. Go ahead. Order this. You won’t regret it. I have not personally tried the next few items from the menu. But have heard rave reviews from other diners. Do try them when you can. I surely will. 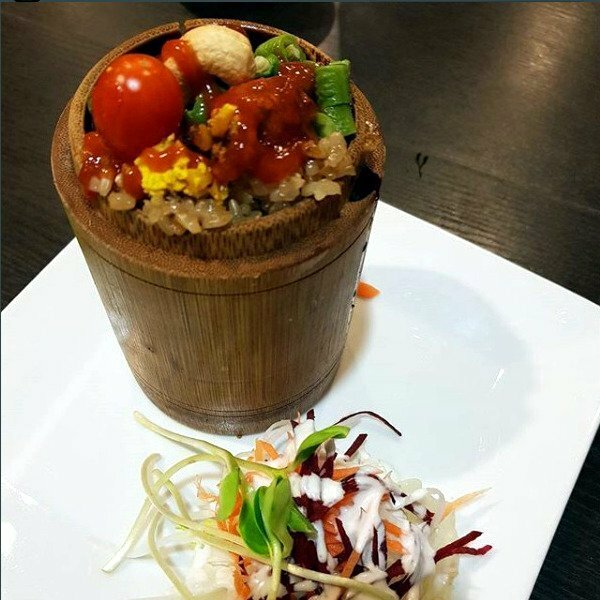 Below is the Bamboo Rice with Mushroom, Tofu and Salad. This does seem like a popular meal. Once, when I sat near the order counter, I noticed many people ordering this dish. The Super Golden Pillow Toast looks so enticing! These days I rarely eat sandwiches or anything with bread. But this looks so good that I may try it on one of those days when I feel like having something with bread. 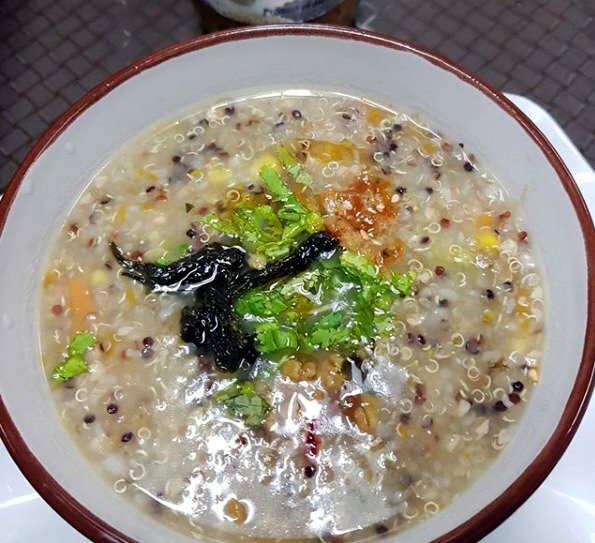 Sophia personally shared with me that the Quinoa with Buckwheat Porridge is a hidden gem on her menu. It is rich with nutritious ingredients and absolutely healthy. She said that if we have this at least once every day, you can see the difference in your body’s health. Sounds great right? 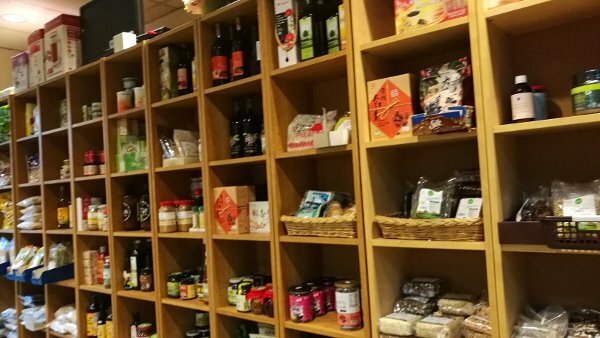 There are many choices of delicious organic food at New Green Pasture Cafe. I wish I could feature them all but it is not possible. What I can do, instead, is to point you to their Instagram account – @greenpasturenew. Follow their account as Sophia does her best to update her followers on the awesome food she offers at her cafe. The interior of New Green Pasture Cafe is simple and unassuming. Not sure what to order? Take a look at their Menu Wall. 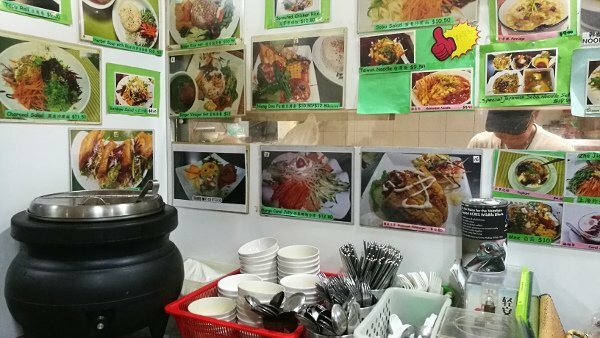 Photos and names of the dishes are shown for easy reference and selection. You can ask Sophia and her staff for more info about each of the dishes to help you decide. Further in, the Dining Area is simple and clean. 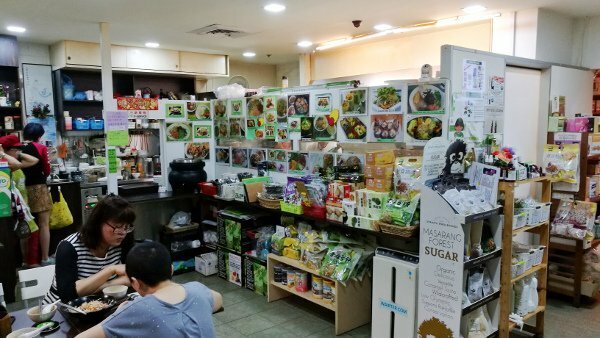 For those interested to try cooking their own organic meals at home, there is a Retail Section inside. Enjoying your meal and feeling a little thirsty? 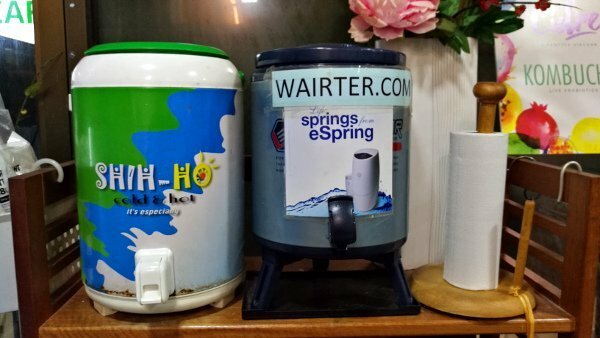 There is a counter offering free water. It is self service, so help yourself to as much water as you like. 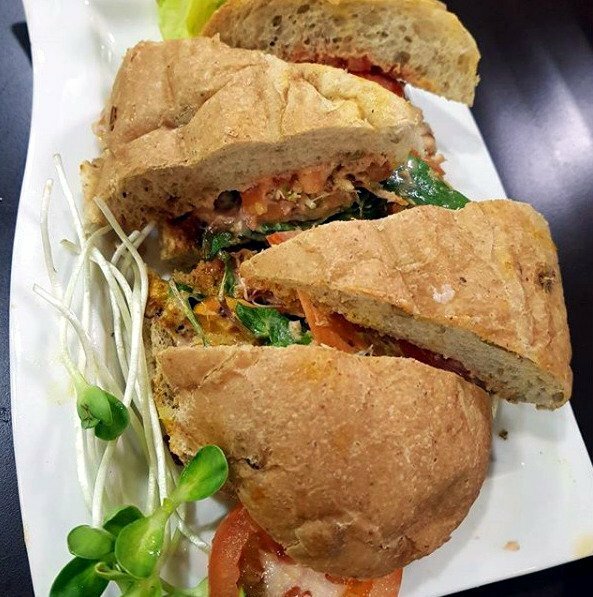 Since the day I first experienced the awesome food at New Green Pasture Cafe, I have shared this hidden gem to many through word of mouth, and via my Facebook account. Everyone I introduced to love the food here, and kept coming back for more. When I started Asia Travel Gems, I had every intent to share this hidden gem with my readers and followers. Finally, today is the day. The food here is truly amazing. And deserves the 5.0 rating. Every dish is crafted from the heart and love. Each meal is unique with its own special taste and flavor. I highly recommend everyone to try the food at New Green Pasture Cafe as I do feel it is really one of the Best Places To Eat in Singapore. If you are hesitant or averse to organic food, you will surely change your mind about organic cuisine. Go to Bugis MRT Station. Walk from Bugis Junction to Bugis+. Exit from Bugis+ to Queen Street. Walk down Queen Street towards Middle Road. 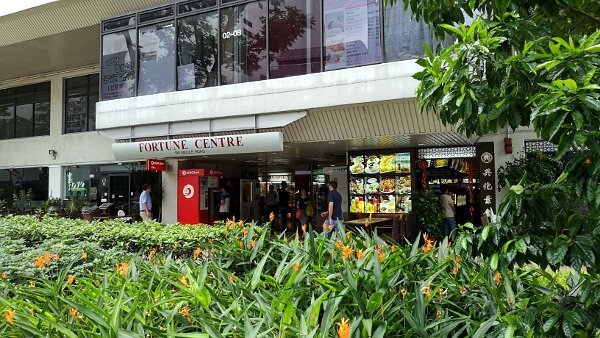 Walk along Middle Road to Fortune Centre. 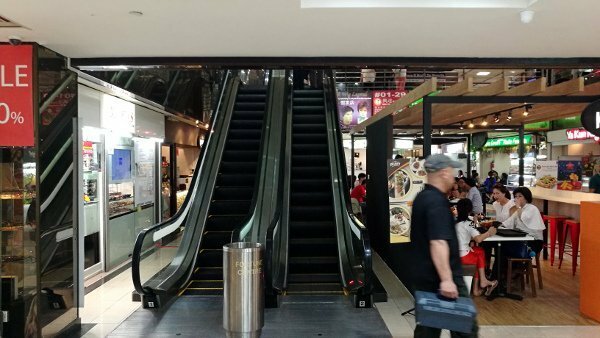 Enter Fortune Centre and take the escalator to the Fourth (4th) Floor. When you reach the 4th Floor, you will then see New Green Pasture Cafe. You can’t miss it! 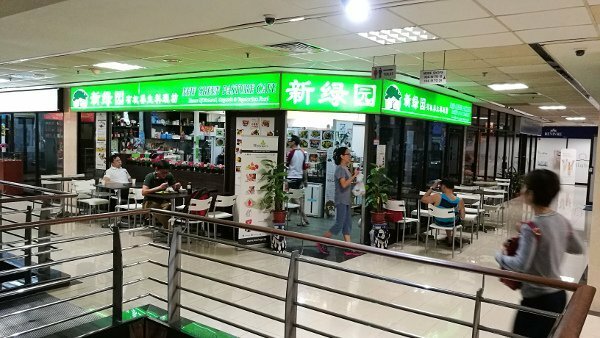 If you have ANY questions about this review, about Best Places To Eat in Singapore – New Green Pasture Cafe, ANY at all, please submit your questions as comments below. I will be happy to help you out. I bookmarked your website, great suggestions here. I am going to Asia early next year but don´t have proper plans yet! Glad to hear you will be visiting Asia next year. Please do come back for more ideas on where to visit, what to eat, etc. We are adding more content on more cities every week! I’m a really fussy eater, here looks like i’d be quite happy! If I ever make it to Singapore… i’ll hop and skip on down to this place! Hi Savita! Thanks for dropping by. Yes, New Green Pasture Cafe’s food is really good, and I am sure you will be pleased. I absolutely love this website! I think this is so cool for when your traveling and just want some extra information on that great food! Or even if your just access to this food locally you can still see great choices. Either way, great site keep it going! And you are right! That’s one of my goals for Asia Travel Gems – to introduce great places to visit, great food at the citiies, and even great hotels to stay at. I am very encouraged by your compliments and praises. These pictures look so delicious. I haven’t been to Singapore. But I am planning a travel with my wife. When we travel Singapore, we will visit New Green Pasture Cafe. You’re most welcome, Eli. 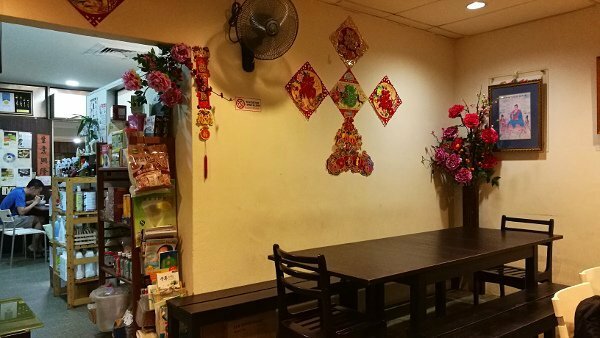 Glad this post about New Green Pasture Cafe – one of the Best Places to Eat in Singapore helped you. The food is really as delicious as the pictures. When you are in Singapore, and have tried the food here, do drop me a note to let me know about your experience? Also, do visit the other posts on this website about places to visit in Singapore and where to stay in Singapore. Will be posting them soon. Thanks for this post.Next year I am going to Asia.I will probably look for some nice place where there is good food. I have been wanting to take a trip to South East Asia soon and from this post I should definitely take a stop in Singapore and check out this restaurant- thank you for this mention because I probably would not know about it any other way. I am always down to eat healthy and tasty food. I do believe in the “let food be thy medicine, and thy medicine be thy food” philosophy. All of the dished look AMAZING (the photos have my wanting each dish). I may have to go there a couple times because I would want to try them all. The fact that you added some helpful directions is quite a bonus. I will need to come back here when I visit… keep up the great work!! 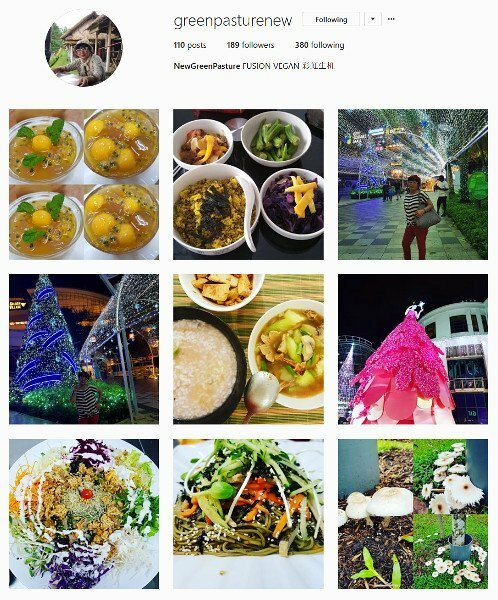 I am so happy that the photos of the food enticed you to visit New Green Pasture Cafe (truly one of the Best Places to Eat in Singapore), and try as many of the dishes as you can. You will not be disappointed. It looks like new green pasture cafe would be right up my ally! The food looks delicious and of course super healthy. Its makes you wonder what they put on non organic foods to give a person such health issues, I’m a true believer in organic and raw food for this reason. You have a great website. I have always wanted to travel to Asia, if I do end up planning a trip I will be sure to return to site for more information before booking a trip. Glad New Green Pasture Cafe food appeals to you. The food really is delicious. Sophia makes effort to experiment and create dishes that are not only healthy but also great tasting. If you are ever in Singapore, you really must try. I, too, am a believer in organic and raw food. And choose this as often as I can. Wow.. what a great and informative article especially for tourists. I am going to share it with others. Such a a nice and well writtened article, I must say.. 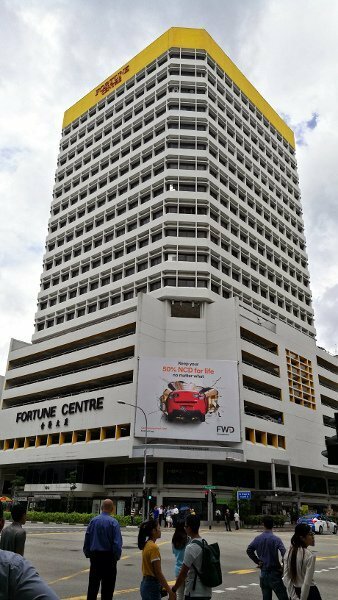 I rarely go to Fortune Centre nor Middle Road nowadays for that matter. But after reading your article, I might just make a trip there! I personally do not cook with organic ingredients so it would be interesting to find out the difference in terms of taste and how it can help me have better health. Thanks for this awesome article. Thanks for a great article. That sandwich looks unbelievable and I am a huge sucker for bread! I was raised eating bread and it’s a staple in my diet due to its low-calorie, micro-nutrient-dense nutritional profile. Does the New Green Pasture Cafe have any meat dishes? I happen to be a meat eater although I do enjoy a vegetarian dish from time to time. It’s been one of my goals in life to get out and travel and the south pacific area of the world is one of my dream destinations! I would love to come in and check this place out which I definitely will once I am able to travel the world. Might be a couple more years. Thanks for a great article and happy holidays! Yup, the sandwich looks incredible! To be honest, I have not tried it yet. Still stuck on the Rainbow Salad with Charcoal Noodles. Next time I dine with my friends there, I will definitely suggest the Super Golden Pillow Toast for all to try. New Green Pasture Cafe does not serve any meat dishes. 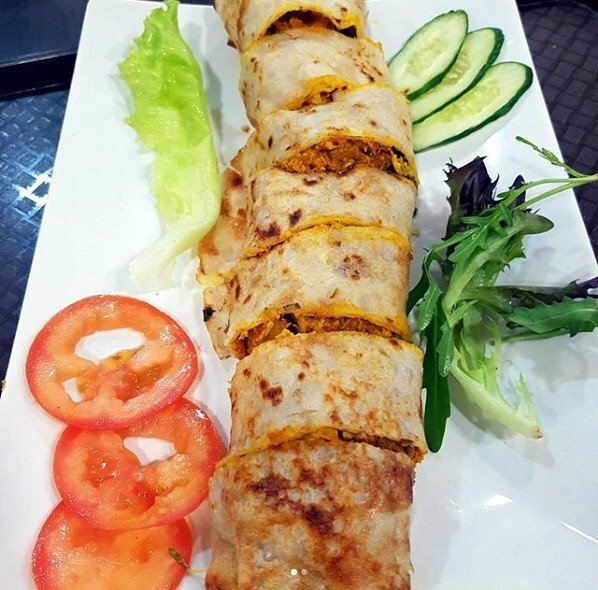 Only vegetarian and vegan dishes. I will be sharing more great places to enjoy good food. And many are cafes or restaurants that serve meat. You will love my recommendations. Watch for it! The moment I landed on your page my mouth started getting watery. I have bookmarked this page. This is definitely something to return to. Your use of images and the variety of meals- mostly vegetable inclined, OMG. I LOVE FAT FREE DIETS!!!!!! This country will be one of my target destinations when I start traveling. Hi Laurine! Thank you so much for the kind compliments and high praise. 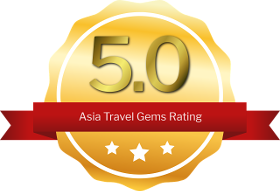 Very happy you like Asia Travel Gems! Thanks for bookmarking us. When you are in Singapore, I hope you will visit New Green Pasture Cafe. And do drop me a note to tell me your experience. You just made my mouth water. I’m a sucker for great delicacies and good vegan food. I’ll probably be traveling to Asia in the near future and would like to try out some of these organic foods. Hi Dennis! Hee hee. Yes, that was my intent. To get visitors’ mouth to water the moment they set their eyes on the photos of the delicious food. And the dishes they serve here at New Green Pasture Cafe are yummilicous! Reading this made me super hungry! The food at New Green Pasture Cafe is right up my alley! I love spicy, and I love how the dishes are shareable so you and your friends can try different things. I especially like the presentation of the Bamboo Rice dish. I can easily stick to organic and healthy options at this restaurant. Thanks for writing and sharing about this little gem. Yes, the dishes are definitely shareable. You have the right idea. Dine with a few friends. Each choose a different dish. And everyone can share all the dishes served. Best of all the food is really healthy! Great website. Great intro to this Vegan cafe. Will surely give a try. Keep up the good work. Thanks Tim! Thanks Andrew! Glad you like this post about New Green Pasture Cafe. Let me know when you experience the food and let me know what you think of it? When I first saw the name of the place, I was expecting it to be located in Botanical Gardens or something. Looks like a place with unique and most importantly, healthy food! Thanks Zokrath! Glad you like the pics. I only use my phone’s camera. The Huawei is quite good. In time, I think I will get an actual camera, a good one for this site. Hahaha. Yes, you are right. Never occurred to me. It does sound like a cafe that could easily be in our Singapore Botanic Gardens. Yeah! Healthy food! Let’s go there one day for lunch or dinner. Love the “About” section, so informative! 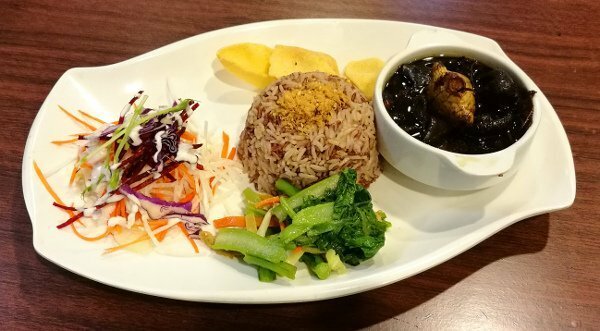 The dishes look so appetizing, especially the rainbow salad and bamboo rice. I have to pay them a visit soon! The pictures enticed me to head down to the cafe one day . The food looks colorful & simply appetizingly delicious . First thing I would try is the sandwich . Singapore is definitely on my list of must travel places, so when I get there I am definitely trying the New Green Pasture Café! I love the organic options! Thanks for adding so many pictures and info! Wow, the food make me drooling. Every one you listed looks so delicious. I already bookmarked your this webpage. Next time I come to Singapore, I will definitely go to The New Green Pasture Cafe and taste the delicious food. Thank you for sharing. hahaha. Yay! Happy to hear that readers are drooling after reading and seeing the photos of food here on Asia Travel Gems! Thanks for enjoying this article, Anthony. The food is really delicious. You must try when you visit Singapore! Wow, what beautiful and tasty looking food items. I am ready to travel to Singapore just for food! Hi Tanya, thanks for dropping by. The food is really delicious! Yes, please visit Singapore and rest of Asia. Lots of good food here. 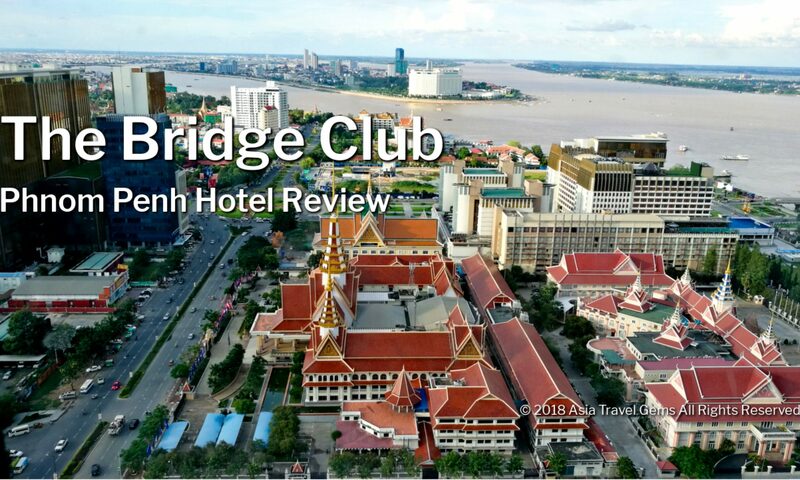 Also, when you visit Asia, this website can be a very good resource on what to see, where to have great food, and great deals for very nice hotels to stay at. Love, Love. Love this site! The food all looks and sounds so wonderful. I want to jump on a plane and go on an eating extravaganza! Thank you so much for all of your time and effort into making this such a delicious site for all of us to enjoy! When you are here in Asia, do use Asia Travel Gems as a resource to find the Best Places to Visit in Asia – what to see, what to eat, where to stay, etc. I’m someone who travels a lot and really enjoy trying new foods from around the world. Singapore is definitely on my bucket list. The pictures that you added makes me want to visit there even more. Great stuff! Thanks Chad! Glad you like the post and pictures! This encourages me to get an even better camera to take better photos for all our readers to enjoy. Also to entice readers to visit all the great cities in Asia. Wow, that places looks absolutely delicious. My wife and I are planning a trip to Singapore over the Christmas holiday and I’ve added this to the list of places to stop and eat! Thanks so much for sharing, I’ll definitely be ordering the Rojak. And yes! The Rojak is a must!!! You have created curiosity in my mind. Next time whenever I visit Singapore I will definitely visit New Green Pasture Cafe. I have bookmarked asiatravelgems.com for further updates. I normally take Apple cider vinegar with warm water first thing in the morning and This has helped me lose some weight. Thanks for great Suggestions. You’re welcome Arun! Glad I have inspired you to visit New Green Pasture Cafe. The food is truly delicious and tasty. And thanks for bookmarking Asia Travel Gems. There will be more updates coming to share the Best Places to Visit in Asia. And thanks for the tip on weight loss. I take Apple Cider Vinegar too! Thank you for the wonderful recommendations! This is my very favourite travel blog. Thank you for sharing!! Cannot wait to be back to Singapore again! Hi Markus! Thanks for the kind compliments and high praise. I am so happy to hear this is your favorite travel blog! The food here is really good. Must try! The food looks yummy. I used to eat tons of junk foods and got really sick from them. I decided to change my lifestyle and started to incorporate lots of fuits and vegetables in my diet, and my health problems improved dramatically. Today, I am in a much better state of healthh than I’ve ever been for years. If I ever visit this place in the future, I definite will have to try it out. Thank you for sharing! You’re welcome Hong! Glad to hear your health has improved. You will surely enjoy the food here. Everything is healthy. And the chef, Sophia, creates each dish with love and thought on how each ingredient can benefit the human body. I love Asian Food! Here at Victoria Falls Zimbabwe, we have a restaurant called Num Took and their food is amazing! So when I saw your review here, I was drawn in by the pictures. How lovely that you included the owner’s story – a great example of walking the talk – good on her! Thanks for your kind compliments and high praise. I’m so glad you enjoyed the review. Num Took sounds amazing! I must visit there some day. I’m so happy that so many people are attracted by the photos and like them so much. This encourages me to improve more, maybe get a better camera too. And yeah, I would love to interview the owners of the places I visit. Sophia was kind enough to consent to the interview. Now, I am thinking I will do my best to talk to the owners when possible. Looks like readers like this too. And the foods make me more excited to travel to Singapore! Would love to try all those with someone special. Next PostNext Best Places To Visit In Asia by Asia Travel Gems Wishes Everyone Merry Christmas!